With this Round Korea tour we explore the western and eastern regions of the country, visiting cities with centuries of rich history, with many UNESCO World Heritage sites, as well as enjoying beautiful scenery along the way. We'll also hike at Korea's most well known mountain, Mount Seorak. On Jeju Island, we discover an exotic destination where horses graze on wide open plains. This is an island where nature makes you feel good, both in body and mind! Upon arrival at Incheon International airport, a driver will greet you with a name board and take you to the hotel on a private basis. After check in, the remainder of the day is free at leisure. After breakfast, meet your tour guide in the hotel lobby. Leave for Gongju the ancient capital of Baekje Kingdom. Experience a tea ceremony with a Buddhist monk at Magoksa Temple, a representative temple surrounded by mountains and rivers in Chungcheongnam-do Province. Next, visit Tomb of Muryeong King with the wall paintings drawn on number six tomb. Then continue to Gongsanseong Fortress, a mountain castle which was established during the Baekje Period and enjoy an archery experience there. Transfer to Daejeon which is a hub city of Korea, famous for its hot springs. After hotel check-in, the remainder of the day is free at leisure in your hotel with its indoor spa offering high quality natural waters. After breakfast, transfer to Jeonju and visit Jeonju Hanok Village which contains over 800 traditional Korea houses. Explore various Hanok buildings and the Jeonju Korean Traditional Wine Museum. Afterward, you will have Jeonju Bibimbab lunch and taste Makkolli (Korean traditional wine) at a local restaurant. Then, visit Tapsa Temple in Jinan, famous for having over 80 stone pagodas built by Lee Gapyong, a retired scholar. Then leave for Gwangju for hotel check in. After breakfast, head to Boseong Green Tea Plantation - beautiful green tea fields with cedar trees. You will also have a chance to taste Boseong Green Tea. Next, visit Naganeupseong Folk Village to observe the dwellings which are indigenous to this south provincial area. Then explore Suncheonman Bay Ecological Park, an area thickly covered with reeds taller than a full-grown man. Finally, move on to Yeosu, one of the country’s most picturesque port cities, especially at night. After dinner, check in to hotel and the remainder of the day is free at leisure. After breakfast, take a Yeosu Cable Car, offering the safe yet thrilling experience within a gondola travelling over the sea. Enjoy the scenery of downtown Yeosu and the archipelago around the old seaport. Next, visit Jinjuseong Fortress, which is historically linked to the Japanese invasion in 1592. Afterwards, travel on to Busan, visiting Igidae Park, a coastal walking path, famous for its panoramic views of Marine city and Gwangan Bridge. The rest of the day is free for you to explore modern Haeundae Beach, where you will have time to enjoy its cafes and pubs. You may also enjoy watching busking along the shoreline as well as the experience of Haeundae Market. After dinner, check in to the hotel and the remainder of the day is free at leisure. After breakfast, head to Ulsan and pass through the world’s largest single automobile plant. Also visit Daewangam Park, littered with rocks which have eroded into interesting shapes by the wind and sea. Next, explore Bulguksa Temple, designated as a World Cultural Asset by UNESCO, in Gyeongju. Then visit Gyeongju National Museum and Daereungwon Tomb Complex. Before heading on to Chomseongdae Observatory, choose your preferred Hanbok, (Korean National Costume), and create a special memory wearing the Hanbok with your companions. Lunch and dinner will be served en route at local restaurants. After hotel check in, the rest of the day is free time at leisure. After breakfast, we transfer from Gyeongju to Andong and visit Andong Hahoe village, home to descendants of the Ryu clan of Pungsan and well-known for its traditional houses. Then, travel on to Wonju and visit Hanji Theme Park where you can get a chance to experience the Hanji making process. We then, transfer to Pyeongchang. After hotel check in, the rest of the day is free at leisure. After breakfast, stop by Ski Jump Tower, (used for the Winter Olympic Games held at Pyeongchang in 2018), and then explore Jumunjin Seafood Market, displaying a variety of fresh seafood caught along the East Coast. For the next stop, transfer to Yangyang for a short hike at Jujeongol, Mt. Seorak, to enjoy its natural beauty. After breakfast, meet up with the tour guide in the hotel lobby. The tour starts with a visit to Gwanghwamun Gate, the main gate founded by the first king of the Joseon Dynasty where you can enjoy the Royal Guard Changing Ceremony. Next, explore Gyeongbokgung Palace (Changdeokgung Palace on Tuesday), arguably the most beautiful and the grandest of all five palaces. Also visit the National Folk Museum of Korea. Then pass by Blue house, also called Cheong Wa Dae, the presidential residence. Then you will visit Insadong-gil, which is connected to a multitude of alleys that lead deeper into the district, with modern galleries and tea shops. Also visit Jogyesa Temple, the chief temple of the Jogye Order of Korean Buddhism, becoming so in 1936. Afterward, head to Myeongdong, one of the busiest places in Seoul and among Korea’s premier shopping destinations where you can enjoy lunch at a local restaurant. Then explore Namsangol Hanok Village (Bukchon Hanok Village on Monday) where there are five restored traditional Korean houses and pavilion, a pond, and a time capsule. Next, visit North Seoul Tower, which offers panoramic views of Seoul and the surrounding area. After the tour, transfer to your hotel. After breakfast, meet a local driver at hotel lobby and transfer to Gimpo Airport for your flight to Jeju Island. Upon arrival at Jeju International Airport, meet a local driver with a name board and transfer to the hotel. After check in, the rest of day is free time at leisure. After breakfast, your guide will pick you up in the lobby of your hotel. Visit Jeju Folklore & National History Museum, which displays mainly natural historical items such as marine life, soil and rocks, plus fauna and flora of Jeju Island in a three-dimensional way, as well as showcasing the lifestyle of Jeju Island, such as traditional housing architecture, rites of passage, and regional food specialties. Move to Hallim Park, a site consisting of botanical gardens, lava caves and a folk village. Then experience a trek to Mt. Songaksan along the Dulle-gil hiking trail that provides some of the most beautiful views in Jeju with the sound of the sea as a background. Witness the spectacular volcanic rock formations of Jusangjeolli Cliff. Then, visit Cheonjeyeon Falls; composed of three-staircases of waterfalls. The first waterfall boasts a pond that is 22m in length and 21m in depth, and whose waters flow downwards to create the second and third waterfalls. The area surrounding the Cheonjeyeon Waterfall is home to rare plants and shrubs. We then visit to Mysterious road, which has earned its name because objects and liquid will appear to roll and flow up the hill instead of down. Such images of gravity defiance are in fact an optical illusion caused by the seemingly high surroundings..
After the tour, we will transfer you to your hotel where you can spend the rest of the day at leisure. After breakfast, your guide will pick you up from the lobby of your hotel in Jeju Island. Visit Jeju Stone Park, inspired by Jeju Island’s history of myth, stone and spirit. The main theme consists of the legend about Seolmundae Halmang (Grandmother Seolmundae) who created Jeju Island and the stones of Obaek Janggun (the Five Hundreds Generals). The park provides a historical and cultural space where collected stones express Jeju’s foundation and culture. Continue to visit Seongeup Folk Village. Located at the foot of Mt. Halla on Jeju Island, Seongeup Folk Village is a small town that contains a vast amount of culture. Move on to Seongsan Ilchulbong Sunrise Peak. Seongsan Ilchulbong Peak rose from beneath the sea in a volcanic eruption over 100,000 years ago. Located on the eastern end of Jejudo Island, there is a huge crater at the top of Seongsan Ilchulbong Peak. Then, drive to Hamdeok Seoubong Beach. Hamdeok Beach is famous for its clean and shallow water, which attracts families during the summer months. The beach offers great scenery with emerald-blue water, an arched bridge over black basalt, and a red lighthouse. 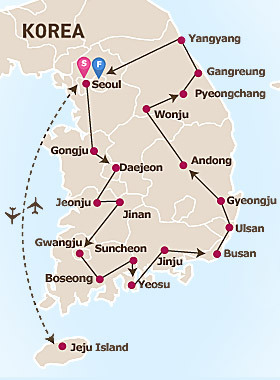 After the tour transfer to Jeju International Airport with your tour guide to take a flight back to Seoul. Upon arrival at Gimpo Airport, you will be met and transferred to your hotel by a local driver. After check in, the rest of day is free at leisure. US$ 2895 per person- based on 2 sharing a room and airport transfers.